One of the many things I love about trail running is that every trail has its own unique terrain and challenge. There are groomed trails that are wide, limestone-based and often even in surface, which make for a great introduction to running off the road. And then there are narrow "single-track" trails with a variety of obstacles, including tree roots, rocks, sand, hills, mud and more. 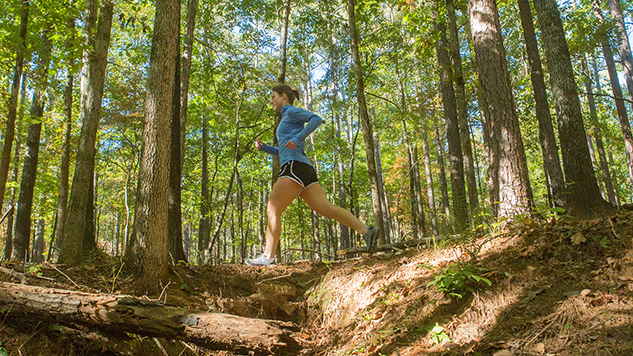 Single-track trails tend to be more challenging in nature and offer a dynamic running experience. Running off road can be exhausting at first, and it may take you up to twice as long as your normal run, especially in the early stages of training. It’s wise to leave your ego at home, slow your pace and focus on finding a new rhythm. In a matter of weeks, you’ll be running up hills you used to walk, and you’ll develop a sense of being one with the terrain. 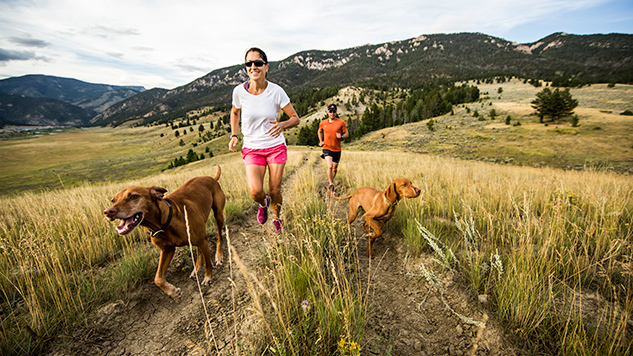 When heading out to the trails, make sure to run with your friends or dog, tell someone where you are going and which trail, and take a cell phone with you for safety. Leave a note with your planned course and bring fuel and fluids. If possible, take a trail map, cell phone, and ID with you, and keep track of where you are along the trail as you go. Always be mindful of what’s going on around you. Stop for other trail users (equestrian, hikers, mountain bikers). Uphill runners should pause for downhill runners. Stay on marked trails and run through puddles, not around them (making the trail wider). Leave no trace, and don't litter. It can be tempting to look at the nature around you, but doing so can quickly lead to tripping and falling. If you want to enjoy the sights, walk it out or stop; otherwise, focus on looking three to four feet ahead to create a line of travel, or where you going to step for the next few strides. This will keep you focused and in the moment -- one of the true gifts of trail running. You will begin to instinctively know where that line is as you become more comfortable running on the trails. Running on trails can be a lot more demanding than the roads, especially if it's a technical single-track trail with roots, rocks, and other fun obstacles. It is best to avoid comparing your pace, as you will be slower than your normal road-running pace. Instead, slow your pace and develop a trail tempo. Run by your effort level, by your heart rate and by the tune of your body. 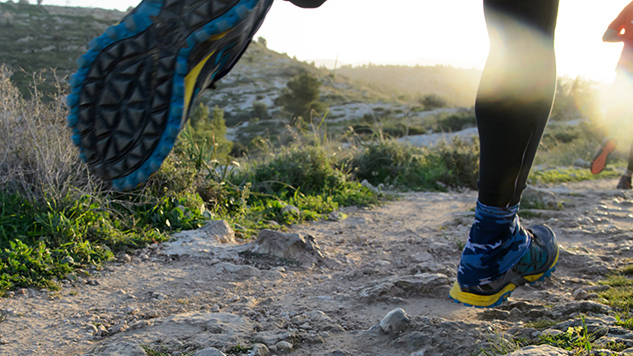 For new trail runners, that may mean walking the hills and running the downhills and flats. Adjust your pace according to the terrain, and maintain a consistent effort level as you climb uphill. When in doubt, walk. Running over downed trees or through mud and sand takes some time getting used to, and it’s best to progress slowly. Tackling obstacles will get easier as your body gets stronger and more seasoned on trails. If you’re going to weave trail running into your life, it’s wise to invest in a pair of trail running shoes. They differ from road-running shoes in that they're lower profile (lower to the ground), which reduces the chance of ankle rolls with a high heel. The rugged tread offers better traction on muddy, wet trails. They should fit snug in the heel but have room in the toe box. Although many trails provide shaded routes, it’s still wise to wear sunscreen. Sunglasses, dark or light, will protect your eyes from tree braches and bushes. Wearing a hat and bug spray will help prevent insect bites and ticks. Make sure to buy some gaiters, as they will keep the dirt out of your shoes. Bringing hydration with you on a trail run is a must, as you never know how long it is going to take to complete the workout. Some days might take longer than others due to mud, water crossings and more. There are various ways to carry fluids on the run – read more about them here. For steep, hilly or mountainous trails, consider using trekking poles to boost aid with balance, reduce wear and tear on your body (four legs good, two legs bad), and boost your hill-climbing strength. Using poles reduces the total impact on the knees and hips, and even helps you burn more calories. Plus, you can put rubber pieces on the sticks and use them on the roads, too! I regularly use trekking poles for staged ultras like the TransRockies event and others because I find them to be PEGs - performance enhancing gear. Take short, quick steps when going up hills, and use your arms. Some hills are meant to be walked, especially on the technical trails. Tell your ego that most ultra runners walk the hills and run the downs and flats -- it’s a trail thing, and it’s okay to walk (promise)! For gradual downhills on groomed trails, lean into the downhill, open your stride and let the hill pull you down. For technical downhills or steep hills, it’s better to use a stair-stepping motion instead; move in a similar motion as you would running down a flight of stairs, keeping your torso tall and letting your legs to do all the work. Just as running intervals will improve your speed, running obstacle repeats on the trail will help create new neuro-pathways and boost your technical trail running skills. For example, run 10-15 minutes to warm up, then find a technical stretch of the trail and run repeats, focusing on form and finding your line. Include optimal recovery as you would with a speed interval, start with shorter trail segments (20-60 seconds), and build to longer stretches (1-3 minutes). Another way to improve your trail running performance is to include strength and balance exercises into your regimen two to three times per week, including: lunges on a pad or stability disk, single leg squats, bridge, push-ups, dips, dead lifts, calf raises, and using a wobble board to develop foot and ankle strength and stability. It can be tempting to hit the trails frequently at first, but it’s wise to allow for adequate recovery, as trail running - especially hilly, technical runs - will tax your body more than you may feel. When you run hard or long on the roads, you feel it, but when you run hard on the trails, you may not due to the more forgiving terrain. Make sure to weave in trail runs once per week at first and then progress slowly by adding one trail run per week every two to three weeks. There are a variety of ways to find trails near your home and on your travels. Connect with local running stores, nature reserves, national parks, social networking and, of course, Google. While you’re at it, make sure to ask about the specific nature of the trail, including wild animals, hazards, bathrooms anything you may need to know when running in a new area.